Jubair Muhammed, composer of Chunkzz promo song Kilikal Vannilla., is glad to have bagged a chance to compose for the upcoming Old is Gold. Jubair begins his acting stint with a song in the upcoming movie Oru Adaar Love. Jubair Muhammed’s first composition for a movie remained in a promo song, yet he is glad that it continues to evoke positive reviews. The two-minute-long promo song of the 2017 film Chunkzz was enough to bring him larger luck. Jubair is the composer and background scorer of the upcoming movie Old is Gold directed by Prakash Kunjhan with noted names like Haricharan, Shwetha Mohan and Remya Nambeeshan crooning to his tunes. “I have done five songs in the movie in addition to the background music. There is a duet I sing along with Shwetha,” says Jubair. After the film, he was seen and heard once again, for the 80s music album by Chumaduthangi band, which became quite a sensation on social media. All through the conversation, he repeatedly thanks Chunkzz maker Omar Lulu, the association with whom brought him unexpected opportunities. For the director’s next, Oru Adaar Love, he becomes an actor for the first time. The Chumaduthangi song, knowingly or unknowingly, added a brownie point. “I act as a singer of Chumaduthangi song, sung by Vineeth ettan, composed by Shaan ikka. It is featured as a youth festival event. I am not a singer in the band, but one of my friend is a member in it. Thanks to Omar ikka, his support and encouragement make good things happen in my life. Similar was the motivation from Thajudeen ikka (project designer of Chunkzz). Omar ikka has hinted me about some surprise in store for Chunkzz 2, that I am eagerly looking forward to,” says Jubair. 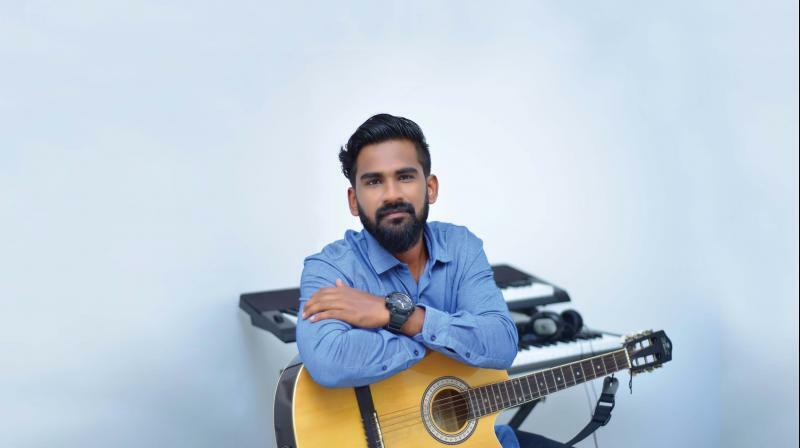 That the first-ever song was not included in the movie bothers him the least as many cinemas still play Kilikal Vannilla before the screening of movies. “Recently, I received a call from a friend. He happily shared with me that, my song was played in a theatre before the commencement of Aadu 2. Reception and reviews from Gulf countries too are overwhelming,” he says. Being a musician, Jubair can handle a few instruments like melodica, keyboard and guitar. “Not an expert, but I have some know-how to produce music using those,” he says. An interior designer who runs his own business at Attingal in Thiruvananthapuram, Jubair arrived in Mollywood with his friend Dinu Mohan, who penned the lyrics for the Chunkzz promo. “Dinu is the lyricist of two songs in Old is Gold. Three more movie projects, yet to be announced, are in the pipeline,” he concludes.